It’s 1952. When a nun at a remote abbey in Romania commits suicide, the Vatican sends their investigator, Father Burke (Demián Bichir) to look into it. For no apparent reason, he’s also ordered to take novitiate Sister Irene (Taissa Farmiga) with him. They meet the fellow who found the body, Frenchie (Jonas Bloquet) and talk him into taking them up to the abbey. None of the villagers native to the area (Frenchie is French-Canadian) will go up to or even talk about the abbey, which is wreathed by a hedge of crosses (they seem intended, Frenchie observes, to keep evil in rather than out) and heavy fog, with a smattering of crows to add to the ambiance. These are all familiar elements (did you guess that Father Burke is haunted by a failure in his past? ), and whether they work for you depends on how much of the heavy lifting required to suspend disbelief you’re willing to do. Think of a cheap haunted house attraction – you know what you’re probably going to get, and you’ll enjoy it more if you go in with a willingness to engage. If you’re not willing to meet the movie at least half way, chances are it won’t work for you. The actors are all good sports and do solid work with the lines they’re given. Farmiga, like her sister Vera (who plays Lorraine in “The Conjuring” and “The Conjuring 2”), has an ineffable something that makes her resolve and determination in the face of evil feel real. Sister Irene is naive and not at all trained to deal with demonic forces, but she cares deeply about other people and is surprisingly resourceful in a pinch. Father Burke is disappointingly incompetent for a lot of the film. We’re to believe he’s some kind of international Vatican agent, investigating miracles and conducting exorcisms at the behest of his superiors in the Church, but he is woefully unprepared for what he finds at the abbey. Plus, what kind of idiot uses his bare hands to press a metal cross to a demonic entity and then is shocked when it heats up and burns him? If he were more competent, however, the plot wouldn’t work as well and Sister Irene might not have had to take the lead in saving everyone, so it’s understandable narratively, but it’s frustrating as a viewer. Be prepared for jump scares galore (some of which are more effective than others) and plenty of gross-out corpse material. The visuals and effects are mostly solid, though, even if the things they’re depicting are ridiculously over the top – early in the film, for example, a cross hanging on the wall turns itself upside down and bursts into flame. This is not a subtle movie, at all, in any way. Completist fans of The Conjuring universe of movies will definitely want to see this, though it may not work as well as other films in the franchise. 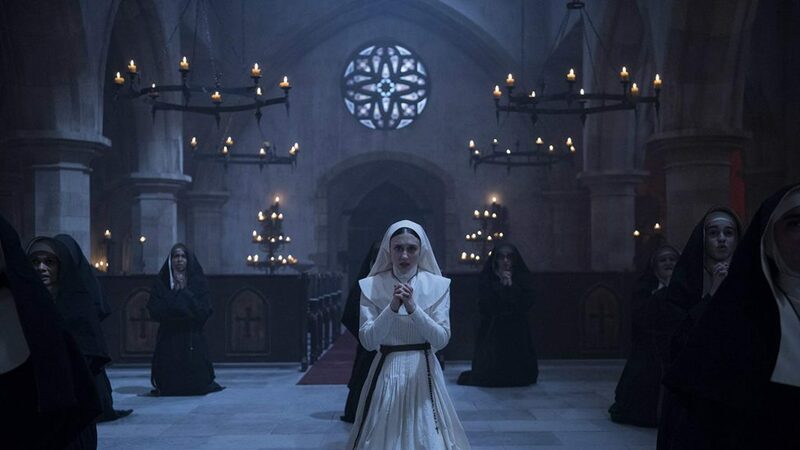 Horror fans willing to be good sports about the flaws of “The Nun” will probably enjoy it. If you’re looking for a smart horror film, an effective slow-burn kind of thing, you will be disappointed.